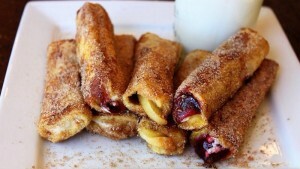 Christmas breakfast is here: rolled french toast! Probably one of the best memories in my life is what my mom and grandma made for Christmas breakfast. It’s a little different in Peru. We have pannetone and homemade hot chocolate and that is probably still one of my favorites. I feel what makes it taste so good is the story or memories behind it. Every year since I’ve been living in the states I eat pannetone for most of December and my girls love it too. But for their Christmas breakfast they prefer Belgian waffles, french toast, eggs and homemade fries…lol! Roll the bread around the filling. Pass it through the egg and milk mixture and put it on the flat skillet to brown it. As soon as you take it out roll them thru the sugar and cinnamon mix and serve them. Yum! Wishing you a MERRY CHRISTMAS! Thanks for stopping by.